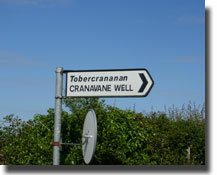 Though the well is marked 300m from the road on the OS map it is much closer. The narrow path is well cared for but better to walk. This is a beautiful spot to stop and be quiet and enjoy the connection with the past. An information board is very informative and gives a snapshot of what this well means for the area. There are actually two wells here. 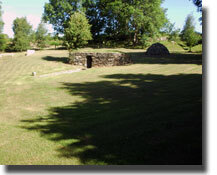 The upper well is a simple holy well with a stone-built house. The lower well is covered by a simple stone house. In front of the latter is a long coffin-shaped trough. The sign by the entrance to the enclosure says that it was once customary to dunk coffins in this trough before they were taken to be buried at Barragh Church, 400m to the west. There is a sign warning that the water from both wells is not suitable for drinking.